Notes: [source, RudermanID53822] Unrecorded German South African War Map, Boer War -- Includes Manuscript Annotations Detailed map of the Theater of War in South Africa, published in Karlsruhe, including extensive manuscript annotations and the location of crossed swords, locating battles. 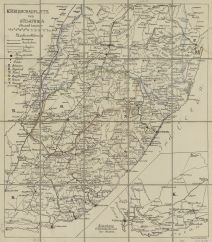 The map is focused on lines of communication, including roads, railroads and rivers, with the various regional powers identified with letters and color coding, including: British Lands Orange Free State Portuguese Lands Transvaal Manuscript Annotations The manuscript annotations on the map are concentrated in the region west of Durban and south of Ladysmith, covering much of the area labeled as Kapland. Among the annoations are: Estcourt (General Sir Redvers Buller first established his Natal headquarter. Winston Churchill, then a war correspondent based in Estcourt) Willow (Battle of Willow Grange) Ennersdale (location of Boer Forces) Tugela (a reference to the Battle of the Tugela Heights) Stormberg (Battle of Stormberg) Howick (Location of a British Concentration Camp) LIdgetton (Battlefield during the Boer Wars) Springfield Rarity The town of Karlsruhe where the maps was produced was a prominent Jewish enclave until WWII.